I am so glad you’re here today! I’ve been having one of those headachy, hard-to-focus days and all I wanted to do was curl up on my couch with a bunch of chocolate and Pinterest. Ever had one of those days? I know I’m not alone here. 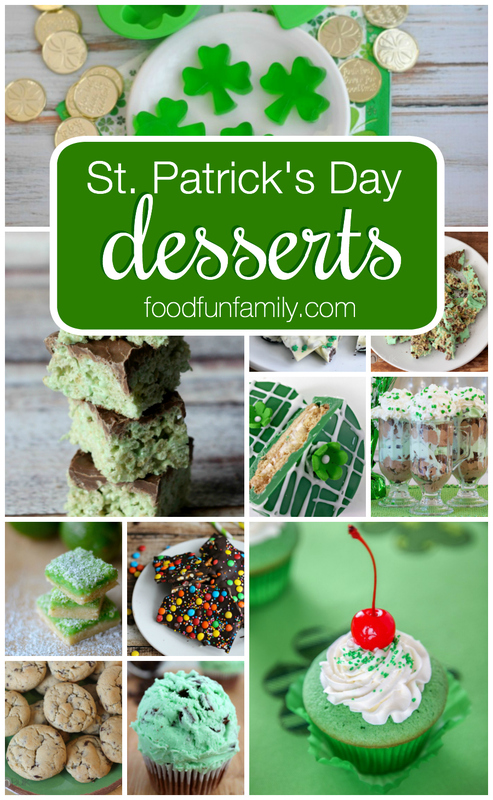 I’ve been drooling over all of the amazing St. Patrick’s Day desserts on Pinterest and blogs and so I felt compelled to share a few of the BEST recipes that I found. Hopefully my obsession with all of these green and minty and rainbow-y treats can benefit more than just my own belly. And what better way to celebrate the days leading up to St. Patrick’s Day than with 17 St. Patrick’s Day treats? See where I’m going here? There is a recipe for every day in March leading up to St. Patrick’s Day. That way, you’ve got plenty of green things to enjoy all month. Because, really, WHY WAIT until St. Patrick’s Day to indulge in these goodies? Here are 17 days of St. Patrick’s Day treats from my own blog and several of my fellow blogger friends. Enjoy! Mint Oreo Cookie Bark from Frugal Mom Eh! What are your favorite GREEN treats? Feel free to leave me a link so I can check them out! © 2016 – 2019, Food Fun Family. All rights reserved. Some of those look hard to make, haha. Well, at least for me. I would totally mess up those cute shamrock jello shapes. Great list! Thanks for linking up with Delicious Dishes Recipe Party! Thank you for sharing these awesome recipes with us! We would love for you to share your time and talents with At Thoughts Of Home On Thursday too! So many of these sound delicious! Thanks for sharing with Merry Monday! Yes to Pinterest and chocolate! Hope you are feeling better! Love this round up – pinning! Such a great list of some fun St. Patrick’s Day treats! The kids would love these. Grasshopper pie caught my eye. I like eating green food. So many awesome St. Patrick’s Day desserts to choose from. I want to make the St. Patrick’s Day Mint Chocolate Rice Krispie Treats with my daughter. We would love these. Thanks for sharing these wonderful recipes. How marvelous! I’m ready with my green dye and my green fairy sugar. Every year I make St Patrick’s Day treats.